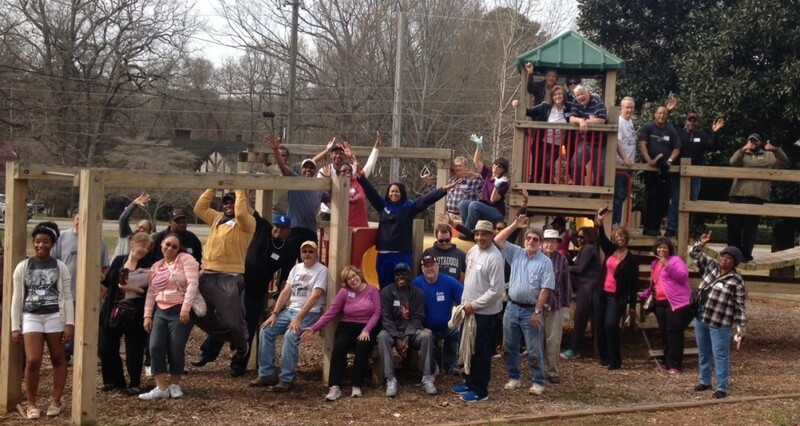 In mid-March, 50 volunteers from 6 Atlanta-Decatur-Oxford District churches “invaded” our campus to pressure-wash, weed, paint, and organize. Volunteers from the churches all worked together on the projects as one big Volunteer Super Group. ADOX District Superintendent Rev. Sharma Lewis was there, leading the way – she is in blue right in the center of the picture. The volunteers from Allgood Road, Avondale Patillo, Glen Haven, Mountain Park, North Decatur and Saint Timothy UMCs worked a total of 150 volunteer hours in one morning! Thank you to all the volunteers, our campus is a safer and more inviting home for our children and families because of you! You can bring your super group to volunteer – click here to find out more. Help UMCH (keep) go(ing) green!